Summer officially ended last week, but you would never know here in South Florida because it is still as hot as ever! (and rainy too!) 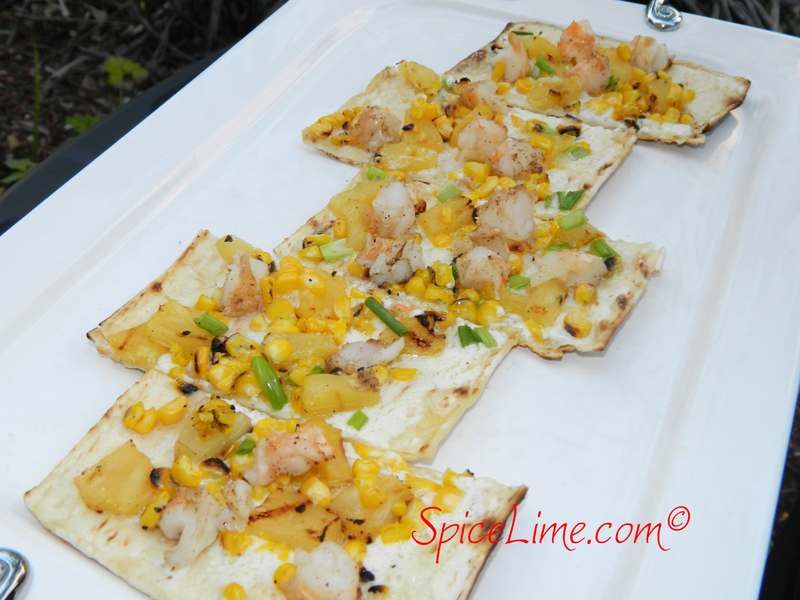 Here is my last grilling recipe to bid summer goodbye...a grilled flatbread that is loaded with spicy jerk shrimp, sweet pineapple, corn and creamy mascarpone cheese! Preheat gas grill on medium. Season shrimp with jerk seasoning and lemon juice. Place corn and pineapple slices on grill. Grill corn until kernels are dark brown or slightly charred, turning twice, about 15 minutes total. Grill pineapple until brown grill marks appear, then flip over, about 4 minutes per side. Remove from grill. Place seasoned shrimp on grill. Cover grill, and let cook until pink, about 3 minutes. Slice corn kernels off of cob. Chop pineapple and shrimp into bite-size pieces. Spread flatbreads with mascarpone cheese. Sprinkle with a little sea salt. Top with corn, pineapple and shrimp. Sprinkle with green onions. Place loaded flatbreads onto grill carefully. Grill until cheese starts to melt and brown grill marks appear underneath, about 3 minutes. Remove from grill using a large spatula. Slice and serve immediately.